There are such a wide range of fun things to do in Barbados, you could spend the rest of your life there and there would still be something you haven't tried yet! View out selection of activities down below! Some of our Barbados activities involve visiting the shores of Bathsheba, located on the East Coast of the island overlooking a turbulent ocean, refreshed by ocean breezes this is a relaxed fishing village with rum shops, local restaurants and an easy going atmosphere, entirely untouched by tourism. Or head over to Sharks Hole, a delightfully unscary place to visit despite its unnerving name. This tiny beach offers tourists pink coral sands, crystal clear waters enclosed by natural reef with inshore waters remaining calm. This is the perfect spot to go snorkelling and spot some beautifully coloured tropical fish. With all of the beaches on the island you’ll be spoilt for choice and for those more adventurous sorts who aren’t satisfied by sunbathing on the sandy shore, there are many activities which you can take part in, including but not limited to: scuba diving, snorkeling, jet skiing, windsurfing, surfing, boogie boarding, kite surfing and many other exciting activities. 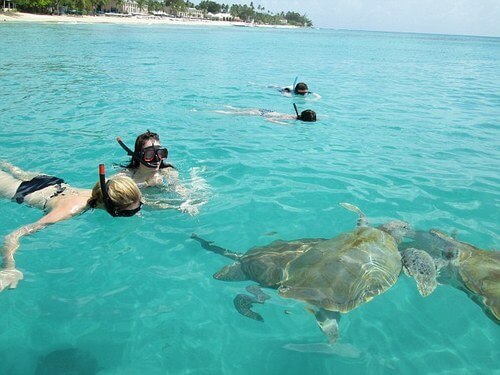 Barbados is surrounded by clear, warm seas (around 80°F) that offer excellent visibility (from 40 to 70 feet) – and when you add the presence of the many reefs that fringe the island, then scuba diving is a serious contender for a top water-sport. The barrier reefs, situated between half a mile and two miles from shore, contain big coral heads that provide an ideal habitat for thousands of colourful fish of all types. In addition, there are plenty of wreck sites, which also make superb marine habitats. Carlisle Bay is said to have around 200 wrecks, and 'The Stavronikita' at Folkestone Marine Park is a great diving site as well. If you've never tried scuba diving, then you'll need to acquire some qualifications before you can dive in the sea, but plenty of island dive companies provide tuition and so that you can be scuba-diving as soon as possible. 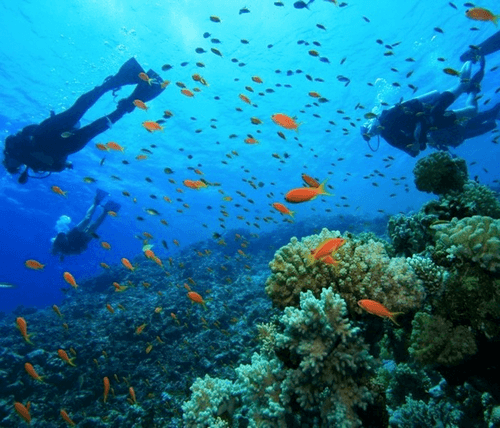 Whilst scuba diving provides you with the air that allows you to stay under water for some time, snorkelling is a surface-based activity dependent on only a mask, a snorkel and a pair of flippers – and it's a great way of getting to meet many of the sea creatures that inhabit the shallow waters round the coast. Snorkelling adventures are available to take you well-chosen sites where you can see fish and turtles, stingrays, manta-rays and beautiful underwater landscapes containing an amazing variety of corals such as brain coral, stag-horn and sea-fans. 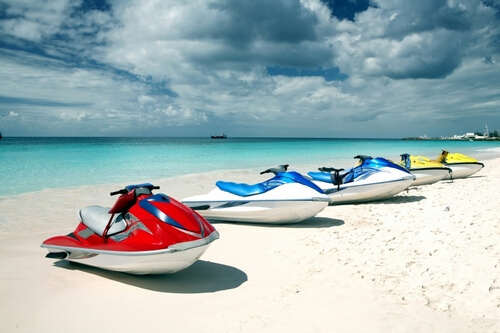 Jet skis (or 'waverunners') have become one of the most popular and exciting water-sports throughout the world, and you'll find that jet skis are available for hire from most bays and beaches around Barbados. Seating up to three people, they're easy to ride and control, and with rapid acceleration plus impressive turns of speed, they're huge fun and are also very stable. They cost around $50 (US) for half an hour's rental in peak season, and all reputable operators will provide you with proper life vests and full instructions. It's a good idea to wear a waterproof watch when you're riding your jet-ski so that you don't exceed the agreed rental time. Apart from Hawaii, Barbados is probably one of the best windsurfing locations in the world, with frequent high winds and waves that are perfect for jumping and riding, especially when those sideshore winds blow. The south coast is where the action is, and it's a great spot for windsurfers of every skill-level, from beginners up to professionals. 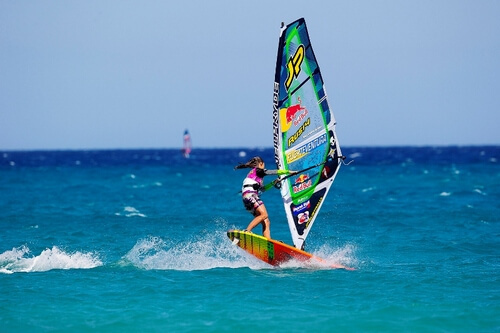 The best time of year for windsurfing in Barbados is when the trade winds blow, from mid-November to the end of June – though the rest of the year still produces excellent conditions. The most popular sails for Bajan waters are 5.0 - 5.5 m2 – and waves can reach mast-high and above. Compared to Hawaiian rollers, Bajan waves are slower and not as powerful, but are plenty good enough to turn some spectacular tricks if you know what you're doing – and for beginners and top riders, check out Silver Sands, which is a hugely varied and forgiving windsurfing spot. Given the location of Barbados, in the midst of a deep ocean, the big waves of the open sea constantly make landfall here, raised up by shallow waters and reefs, and thus creating a perfect surf-location that lures surfers from all over the world. Swells roll in from all points of the compass, so in Barbados, you can always be sure that surf's up somewhere, especially on the east and south coasts – in fact the east coast's 'Soup Bowl' is internationally recognised as one of the best spots in the surfing world. If you're into lie-down short-board boogie-boarding, Barbados does the business – especially at Inchcape, where you'll be sharing the same shore-break with stand-up surfers. In addition, Silver Rock, Long Beach, Foul Bay, Crane Beach and Sam Lord's castle all attract the boogie-board community. Once again, Barbados is a winner for this relatively recent, but now hugely popular sport. 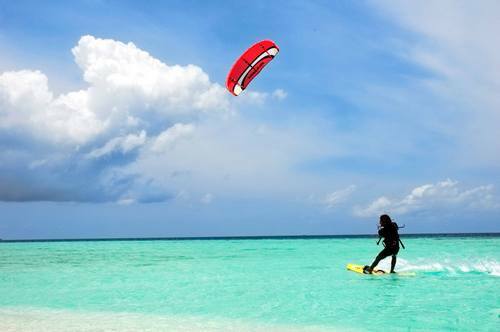 Constant trade winds make for reliable conditions – and given the variety of locations available for kite-surfing, you could spend virtually every day of your holiday riding the winds and waves in a different spot. Going underground is not something you'd expect to do on the sunshine island of Barbados, but when you visit Harrison's Caves, you'll discover a whole world of wonders beneath your feet. Harrison's Cave is an amazing natural gallery of delights, with stalactites tens of thousands of years old hanging from the roof of the cave, and stalagmites stretching upwards from the cave floor – and sometimes the two meet to create floor-to-roof pillars. There are also crystal-clear streams running through the cave, as well as waterfalls and deep pools. It's well worth arriving early in the morning to appreciate the unearthly beauty of this place when it's peaceful and quiet. Known locally as 'The Gap', this lively corner of the island offers a choice of nightclubs, each with its own distinctive brand of music and clubbing. 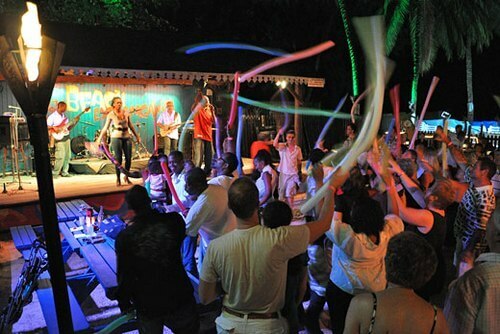 The Cove ranges effortlessly from reggae and calypso to Rhythm & Blues, whilst the Old Jamm Inn combines live music with hot tunes from around the Caribbean and from neighbouring South America; and with a name like Monkey Nutts, you can imagine that there's more than a hint of craziness at this tropical-vibe club. Friday night is Fish Fry night in Oistins, where all sorts of freshly prepared goodies are on sale to eat and drink in a party atmosphere. Drawing both visitors and residents, this is a perfect place to mingle and meet with locals who love to celebrate the end of the working week at this regular event. The food market is set up at Oistins Bay Gardens, where you'll find a whole range of freshly cooked fish on sale, such as mahi-mahi, swordfish, tuna, marlin, and flying fish. 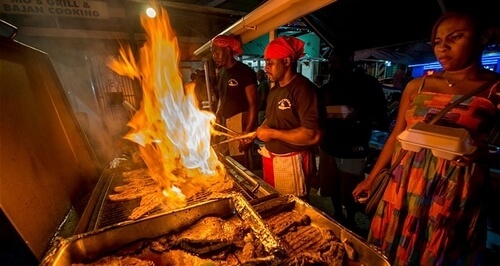 Lobster and chicken are also served, and whatever you choose, you can have it freshly grilled or fried right in front of your eyes, depending on which vendor you choose from. There's plenty of informal seating, and it's great simply to sit, eat and watch the world go by, though there are also art and craft items on sale, including leather goods, wood carvings, clothing, jewellery and ceramics. There's music as well, and the evening often ends up as a great outdoor party. 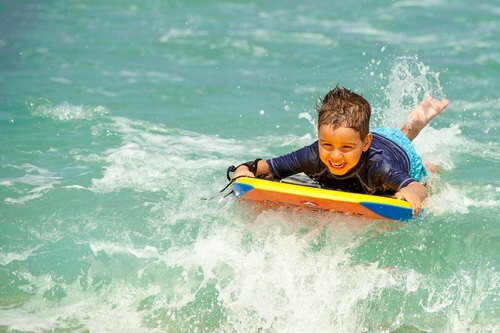 For more information visit here for all you need on activities in Barbados!